Yesterday I received 2 SMS from my Gmail account. Somebody tried to login to my account. He/she tried to use SMS to reset my password. Can anybody tell me how to find the IP from which the attacker sent the password recovery SMS? I didn't get any email from the Gmail team. I could easily login with my previous password after the attack. To see the IP addresses and access methods for your Gmail account, you probably want to look at the Last account activity page. 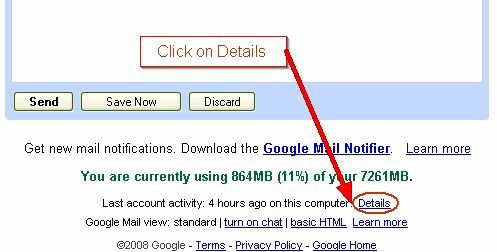 This page is accessed by the "Details" link at the bottom of the gmail web page. I'm not sure there is a way to find out the originating IP of a password recovery request, however it is very unlikely that your gmail account was compromised via the SMS recovery method. For this to happen, the attacker would have had to somehow login to your account (know your password in the first place), then update your recovery options and change the phone number. So the good news is that your account is probably still secure, and you got an SMS message from google which alerted you that someone tried to use SMS password recovery and probably failed, as long as they have no access to your phone or SMS messages. Not the answer you're looking for? Browse other questions tagged gmail password-recovery ip-addresses or ask your own question.